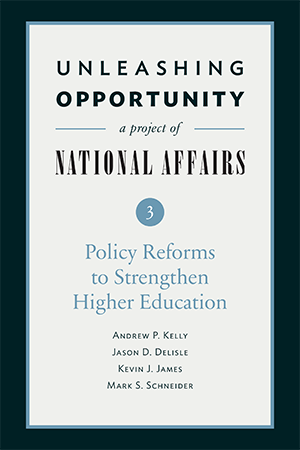 National Affairs is proud to present Unleashing Opportunity, a series of three brief policy books designed to help policymakers in Congress and the administration take up the challenges surrounding innovation, higher education, and regulatory policy. Each installment in the series is available for download below. You can also find Kindle editions at Amazon.com. If you’d like a hard copy, please contact Emily MacLean at editors@nationalaffairs.com or (202) 289-4100. The first installment in the series, Policy Reforms to Advance Innovation, is available for download here, or get the Kindle version at Amazon.com. 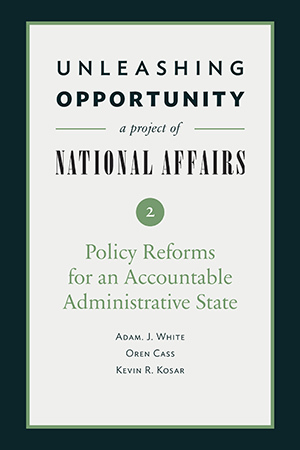 The second installment in the series, Policy Reforms for an Accountable Administrative State, is available for download here, or get the Kindle version at Amazon.com. The third installment in the series, Policy Reforms to Strengthen Higher Education, is available for download here, or get the Kindle version at Amazon.com.